You imagined well - this looks great! 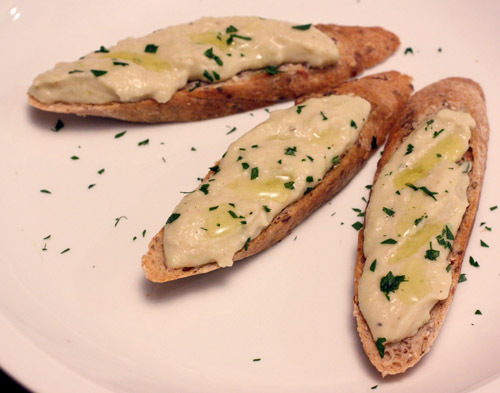 What a creative idea to combine the white bean and zucchini puree and perfect with truffle oil! I also loved da Rosario products! Perfect veggie dip or sandwich spread. I happen to have over 2 lbs of white beans that I got from Vic's grandparents' garden. I have already cooked them and need to use them up within the next 10 days before we return to Miami. This is perfect. Thanks! Very clever Lisa! I never thought of combining the two together. It seems work here. Truffle oil sure make any humble dish become more luxurious. I've also read so much about truffle oil. I have 2 bottles sitting here and needed inspiration. I love white beans and the addition of the magic oil spread on toasts sounds great! This looks like a great use for truffle oil, good thing I have some in my pantry! Another wonderful dish. Truffles always stops me in my tracks at a restaurant, too. Yum! i'm not sure anything could sway me from naming hummus as my favorite bean puree, but this would come mighty close! it looks so unbelievably creamy--stellar work! That is GORGEOUS. I love any type of bean puree... and this is perfect because two of my friends who are vegans are coming over for dinner this weekend and this looks like the most perfect appetizer to serve! OK not a big fan of truffle oil, but the rest looks to-die-for. I bet a balsamic drizzle would be great over this too. Yum! what a very cool idea to incorporate the zucchini. i'm bringing vegan treats to a girls' retreat soon; this would be perfect. great meeting you the other night. happy cooking! I admired the idea of zucchini puree. Never tyhought it before, but sounds just superb when combined with garlic and white beans. Thank you for sharing. I'll definitely try it as I'm always in search for new zucchini recipes. They just sent me a bottle, too. Hmmmm, I'll have to ponder a good use for it. Maybe something with eggs or cream since they both go so well with black truffles. This is the perfect appetizer when you have visitors. Looks chic. I can only imagine how delicious this is! What a beautiful appetizer! Sounds wonderful. I love white bean dips. Will have to try adding zucchini next time. Thanks for the tip! don't you just love truffle oil? this sounds amazing! i love zucchini! What a wonderful flavor combination! And I love your pictures! So fancy looking, but also very tasty. Thanks for sharing! holy...I can just imagine the glorious savory fragrance of the oil in this! wow! what a fab combo! easy and simple, but eye-poppingly impressive! OMG! I cannot wait to try this recipe... like this weekend. Yum! Oh Wow! now I am notusually a fan of zucchini, but this dish is delish!!! By the way I love your images and how you present the food. 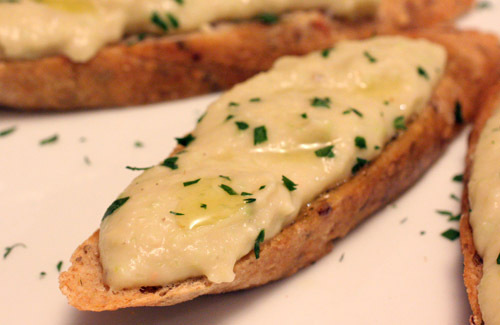 These puree-topped crostini look marvelous! I don't doubt I could an entire platter of these. I never thought of zucchini being used in this way but I love your description of it as making the mixture fluffier. Now, I just need to get that bottle of truffle oil . . . I LOVE this combination and it is good for you at the same time!! Great job!!! Looks Delicious, love the pics. I love the idea of the zucchini puree. These would be lovely appetizers. "I’ve been known to simply stop reading a restaurant menu as soon as I see a dish served with truffle oil or truffles or any variant of truffleness." Me too!! I imagine the truffle oil would add just the bit of bite to the top of these. I just need to let you know that I made these and OMG they were SO GOOD! SO SO GOOD! My boyfriend has been requesting it ever since I made it a few weeks back! 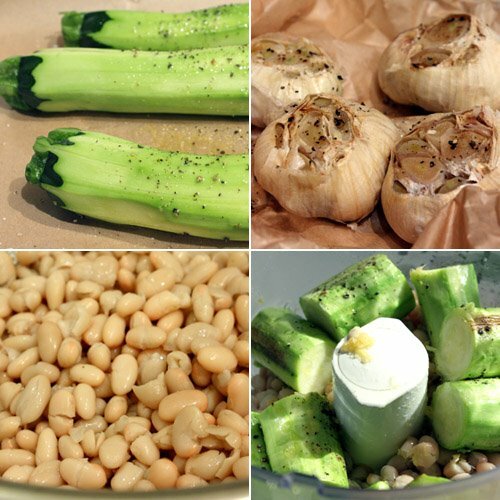 Even last night, at 11:30 pm, he was like "I want zucchini and white bean soup"! haha!